Skillet cookies – with their gooey centers, crisp edges and shareable size – have been steadily gaining popularity over the past year or so. They’ve gone from unusual dessert menu item to a treat that many people bake at home. You can make a skillet cookie with almost any cookie dough, including prepared dough, but Trader Joe’s decided to make things even easier with their newÂ Deep Dish Chocolate Chip Cookie. 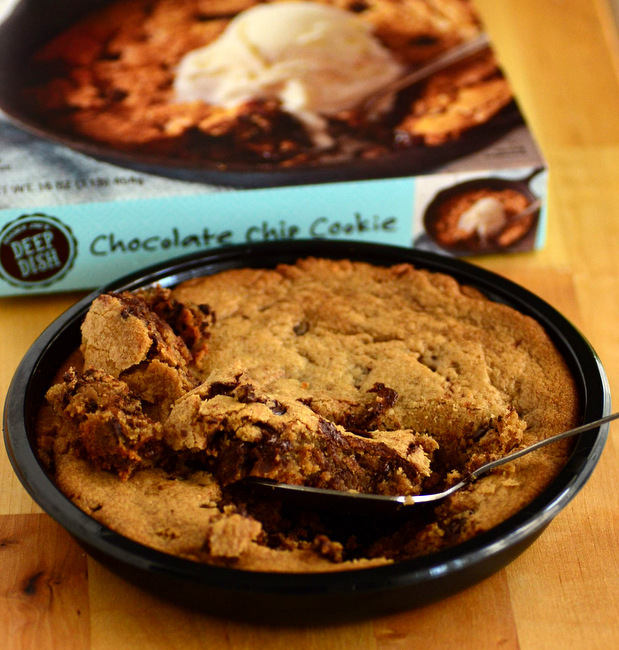 The 16-oz cookie comes frozen, in it’s own baking dish (not a skillet, but close), and ready to become your next quick-fix dessert. The cookie is pre-baked and includes instructions for heating it up in either the microwave or in the oven. While I’m usually a proponent of using the oven to cook frozen foods, I strongly recommend that you use the microwave for this one. Since the cookie is fully baked before being frozen, baking it a second time in the oven tends to dry it out a little bit, making it more of a “large cookie” than a gooey-in-the-center “skillet cookie.” When you microwave it, not only does it take a fraction of the time, but the cookie is softer and gooier – just as it should be. The cookie has a nice molasses and brown sugar flavor, and it is loaded with chocolate chips. All of the melted chocolate is what makes this cookie worth eating, filling your mouth with every bite. The fact that you can microwave this is a huge plus and gives you a good reason to consider it instead of baking a from-scratch skillet cookie. That being said, the from-scratch cookies will be gooier and will be better leftover (since leftovers of this cookie will find themselves in the oven/microwave for a third time to warm them up), but this one works extremely well and is ready to go in less than 5 minutes from frozen. Be sure to serve it warm and consider adding a scoop of ice cream to each serving/spoonful to make it truly decadent.